Theology, liturgy, politics, and more are not inherently wrong, of course, and can even be very good, even vitally important—but none of these is the one thing we need over and above anything else. Let’s start with a quick survey of some biblical texts. It’s not just that “love” is mentioned a lot in the Bible—that’s true, but it’s more than that. It’s the way love is talked about in the Bible that’s so significant. Jesus’ response is right in line with similar teachings from other great Rabbis (e.g. Hillel), and the first part is straight out of the Shema, the daily recitation of devout Jews. But Jesus does something distinctive if not novel: he binds a second command to the “greatest and first,” he connects loving people with loving God. These two loves go hand in hand—you can’t have one without the other. The final statement is crucial. All the Law and the Prophets, the Jewish Scriptures, the entire Old Testament—every command, every promise, every story, every poem—hangs on the hook of these two commandments. This two-dimensional love—vertical love for God, horizontal love for others—is the point of everything in Scripture, it is Scripture’s end goal. If we read anything in Scripture in a way that does not lead us to greater love for God and love for others, we have not read Scripture correctly. What’s the one thing we owe each other? The one, single thing? Love. And what sums up every commandment God has ever given? I mean, every single one—including commands like “Be holy” or “Speak the truth”? Love. And what is it that expresses the underlying intention and overarching goal of the Law of Moses, that brings the whole Torah to fruition? Love. Sounds a whole lot like Jesus to me. Interesting, too, to note why these things are true: because “love does no wrong to a neighbor.” Love does not cause harm to others. Put the other way, love brings good to others. Love is life-giving. That’s why love is the fulfillment of the Torah, whose purpose was to bring God’s people life (Deut 30:11-20). We know that we have passed from death to life because we love one another. Whoever does not love abides in death. Strong words, all of them. Yet they are right in line with Jesus’ Great Commandment teaching: love is at the essence of life, at the heart of God’s will for us, and our love for God is inseparable from our love for others. No wonder another text of John’s depicts Jesus saying that love is the hallmark of true disciples of Jesus (John 13:35). There’s Jesus teaching on love throughout the Gospels, in all the Gospels. 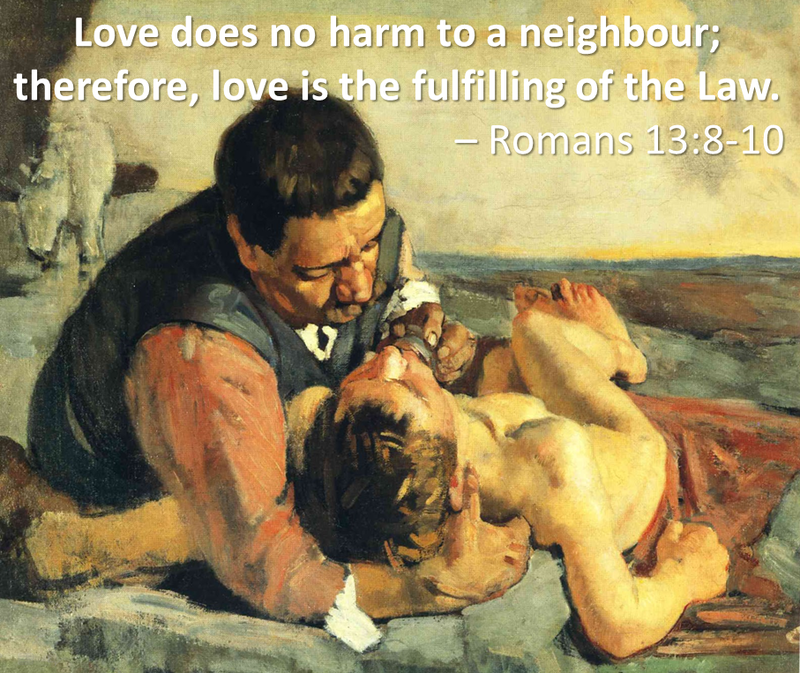 Loving neighbours the same way a Samaritan does (Luke 10:25-37). Loving enemies the same way the Creator does (Matt 5:43-48; cf. Luke 6:27-31). Loving prodigal sinners and self-righteous brothers the same way a Father does (Luke 15:11-32). Loving fellow disciples the same way Jesus does (John 13:34-35). There’s Paul speaking of love in his letters. That love is the “most excellent way,” a far greater way than seeking knowledge of right doctrine, or pursuing mountaintop spiritual experiences, or striving for an ascetic, avoid-it-all, moral purity (1 Cor 12:31-13:13; cf. 8:1-3). That the “only thing that counts,” the thing that really matters most, is “faith working—or being expressed—through love” (Gal 5:6). That love is the virtue that is “over all” other virtues, that “binds together” all other virtues (Col 3:14), including the virtues of moral holiness and truthful speech (3:5-14). There’s John’s three-layered love theology that circles through his writings over and over again: the Father loves the Son, the Father loves us through the Son, and so we are to love one another in the way of the Son (e.g. John 15:9-12). There’s James’ Jesus-like description of “fulfilling the royal law found in Scripture, ‘You shall love your neighbor as yourself’” (Jas 2:8). There’s Peter’s Paul-like summary: “Above all, maintain constant love for one another, for love covers a multitude of sins” (1 Pet 4:8). It’s everywhere. This bottom-line, heart-of-the-matter, sums-it-all-up kind of perspective on love is everywhere in the New Testament, weaving together threads of love that run through the Old Testament. But what is this love? What does it look like? That’s the next post. 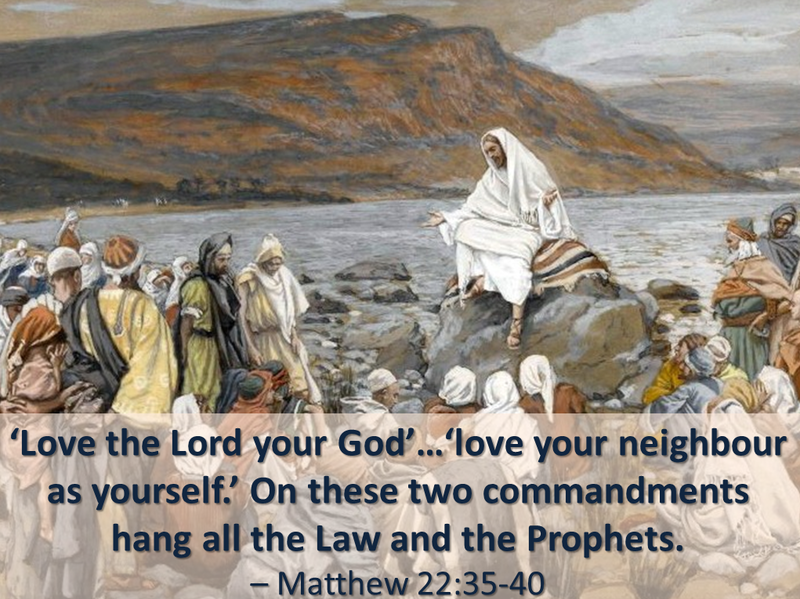 This entry was posted in Michael Pahl and tagged complexity, diversity, great commandment, jesus, john, love, love is all we need, matthew, paul, religious pluralism, virtues. Bookmark the permalink.